By definition, a university seeks to expose inquisitive, enthusiastic students to ideas and experiences that lead them to discover how they can contribute to society and build communities. Mercer University, a private university founded in Macon in 1833 with ever-expanding campuses in Atlanta and Savannah, more than lives up to that ideal in unique fashion, wedding rigorous academic programs to its historical mission of service to others. The school was founded by Georgia Baptists; it remains faith-based but has had no formal religious affiliation since 2006. “From the outset of their Mercer experience, students are encouraged to get outside the confines of the campus,” says Dr. Mary Alice Morgan, Mercer’s senior vice provost for service learning, who oversees programs woven into the curricula of the university’s 11 colleges and schools, which include Liberal Arts, Law, Pharmacy and Health Sciences, Medicine, Nursing, Engineering, Business and Economics, Theology, Education, Continuing and Professional Education, and Music. Within those disciplines, emphasis is placed on service learning, combining in-class academics with community service or community-based research. Mercer’s service-learning component was nationally recognized by the Carnegie Foundation for the Advancement of Teaching, which awarded the school its highly prized Community Engagement Classification. The result is a student like Chelsea Flieger, a Suwanee native who arrived at Mercer in 2008 with the goal of becoming a teacher but ended up graduating in May with a degree in Leadership and Community Service and minors in Spanish and Communication. “My Mercer experience was very different than I planned for it to be,” she says. While taking political science and leadership classes, Flieger discovered a passion for community service. Halfway through her sophomore year, she attended the Clinton Global Initiative University Meeting in Miami with several other students. 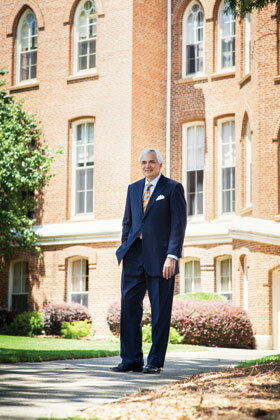 Those words are music to the ears of Mercer President Wil-liam Underwood, who came to the university in 2006. Under-wood continued introducing and strengthening Mercer’s pre-mier academic programs with an eye toward developing the whole student: taking students off the campus and into the world, whether across the street through community service learning or across the ocean through a unique service learning and study abroad program called Mercer on Mission. Mercer on Mission has become a signature program at Mercer – yet another tool in the recruitment toolbox. Not that the university needs much help; it’s ranked No. 9 in the South in the 2012 “Best Regional Universities” category by U.S. News & World Report. Enrollment is at an all-time high, 8,336 in fall 2011, with the student population dispersed among the three campuses, Macon, At-lanta and Savannah, as well as Re-gional Academic Centers in Doug-las and Henry counties, Eastman and Newnan, which offer the same caliber of academics as the traditional campuses. The footprint is expanding. Mercer’s Medical School is building a campus in Columbus in partnership with The Medical Center and St. Francis Hospital, an expansion in keeping with the mission of Mer-cer’s medical school, preparing phy-sicians for rural and medically un-derserved areas of Georgia. Stu-dents will begin clinical rotations this summer. Programs in health sciences account for much of Mercer’s explosive growth, especially at the Atlanta campus, located inside the Perim-eter near the junction of I-285 and I-85. “Growth industries in the next few years are in allied health services,” says Provost Dr. Scott Davis. “Instructionally, that’s a sweet spot for us.” Mercer wisely tapped into that data and positioned itself to respond to the demand for high-quality health sciences education. Approximately 25 percent of Mer-cer’s full-time students are enrolled in health sciences programs. The Atlanta campus is home to the highly regarded Georgia Baptist College of Nursing and the College of Pharmacy and Health Sciences (COPHS), ranked fourth among private pharmacy schools and 43rd overall by U.S. News & World Report. In a move that expedites future growth, university trustees recently voted to create the Mercer Univers-ity Health Sciences Center, encompassing the School of Medicine, located in Macon and Savannah, the COPHS and College of Nursing, located in Atlanta. The new Health Sciences Center will expand in July 2013 by adding a fourth academic unit, the College of Health Professions, incorporating the Physician’s Assistant and Physical Therapy programs, currently housed within the COPHS. The Public Health program and other future health science programs will also come under the College of Health Professions umbrella. “Connectedness,” a common theme in Mercer’s ethos, goes beyond basic connections of students to professors or to their fields of study. For example, Mercer builds connections into the education delivery system. Qualified freshmen are able to obtain guaranteed placement into Mercer’s professional schools and programs, including medical, pharmacy and law. One of the center’s admittedly audacious goals is to “transform the city.” But it’s one Regan-Porter believes is within reach. “Mercer has been involved in transforming the community for about a decade,” he says, “And they’ve done it with forethought and intelligence, respecting the residents. That type of behavior serves the center well because we want to get out in the community and see what the problems are and encourage dialog.” The very location of the center in Mercer Village is a reminder of how much the university has contributed to revitalizing the city. Mercer Village is a mixed-use, high-density development anchoring the College Hill Corridor, an ambitious urban redevelopment project that sprang from a senior capstone course and follow-on course taught by philosophy professor Dr. Peter Brown. Research turned into a proposal that turned into the College Hill Alliance, a department of the university that ad-ministers grants to community organizations and individuals for projects to carry out the master plan in the corridor. Grants have leveraged about $26 million in private investment in the corridor. Thirty years ago, interaction be-tween the university and the community was limited. Today a trolley runs from Mercer Village to downtown from Wednesday through Sunday and a thriving, fluid relationship exists in the community. “We want our students to be involved with the Macon community, but we also want the Macon community to be involved with Mercer,” says Carrie Ingoldsby, director of campus life. Mercer events like concerts and especially athletic events are a big draw for the community. An NCAA Division 1 university, Mercer’s basketball team generated excitement with a 27-11 record and a big win in the CIT (CollegeInsider.com Postseason Tournament) this past season. In 2013, Mercer will field its first football team in 70 years; the university broke ground on a football/lacrosse complex in fall 2011. They’ll play against teams in the Pioneer League such as Drake, Valparaiso and Butler. Combining community building with education is one of Mercer’s strengths, says Professor Silver. “At Mercer, students care about their education. They feel like the education itself matters, beyond their eventual profession,” he says.